Why did I decide to read this book? I picked up this book because I had thoroughly enjoyed Rowell’s character development and her unconventional ‘happily ever after’ in “Eleanor & Park”. I felt that the cartoon cover of this book was more suitable for a younger audience, but the book was so highly acclaimed by readers my age that I figured I’ll see if it was comparable to the first Rowell book I’ve read. And I’m glad I did. Though I’ll still stick with “Eleanor & Park”, this book had many great aspects. I feel that this was the most subtle and less ‘twisted’ part of everything that composed “Fangirl”. A third-person narrator focuses mainly on the troubled life of Cath, an 18-year-old freshman student. Contrary to her boisterous and outgoing twin sister Wren, Cath is introverted, very shy and a Simon Snow (spin-off of the Harry Potter series) fan. 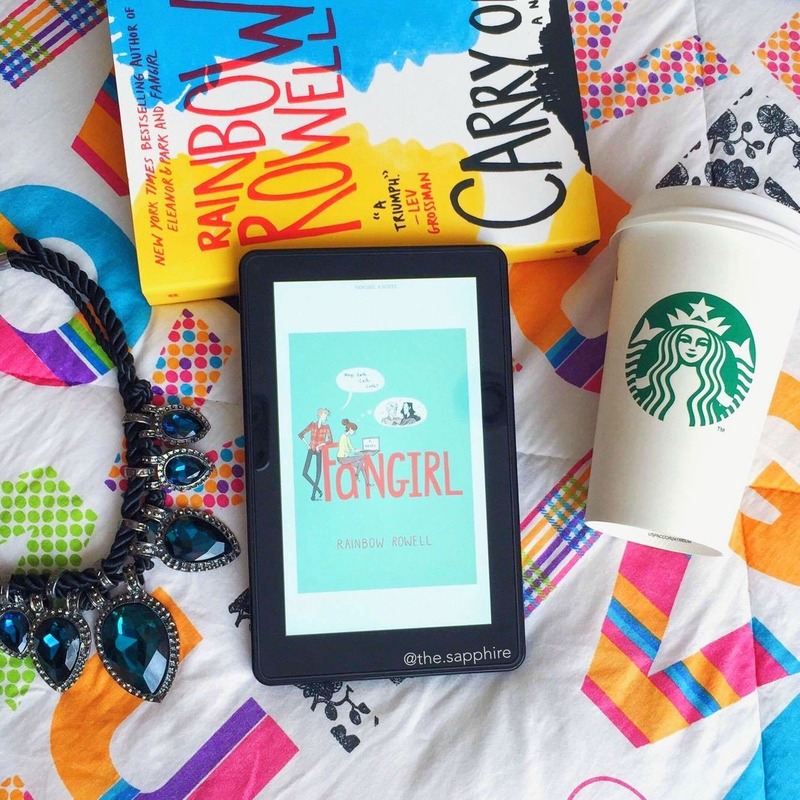 Her love for books propelled her to start her Simon Snow fan fiction 2 years ago, with her flair for creative writing enabling her to create a strong and supportive fan base. Moving away from her single-parent dad into college is a thoroughly daunting task for Cath. Though Wren is attending the same college, she embraces the college party life much more, which leaves Cath hanging pretty much by herself. However, delving most of her time to fan fiction writing and her fiction-writing class, Cath gradually becomes a more approachable and warm person to those around her, even though not all have good intentions towards her. This is the component that I felt was most well-developed and unique, enriching and complementing the ordinary plot. All the characters were flawed to some extent, by things that you wouldn’t normally find in these YA Fiction books. For instance, though the narrator never expresses it directly, Cath is more than just the stereotypical shy and introverted girl who tries to come off as ‘mysterious’ – she actually deals with some serious social anxiety, which is a huge obstacle when she is just settling at college. She is still resentful to her mother Laura for leaving her family, and does not make up with her even Laura nonchalantly ‘attempts’ to reconnect with her daughters. The fact that Cath is not the typical kind of girl that you would relate to, the clarity of the narrations enables you to understand her troubled feelings and thoughts. Wren, Cath’s twin, comes off as the more confident sister that gets accustomed to her college life right away. But in reality, she’s more chaotic and careless than an 18-year-old should be, which serves as a wake-up call for the family. So despite the twins’ disagreements about drinking and Laura (and life in general), which leads to their strained relationship throughout most of the book, the ending shows that the bond and history that they share will always bring them back together. Levi, the unbearably nice and understanding boy that Cath likes (and whom she thought was her roommate Reagan’s boyfriend until months later), apparently struggles with a disorder (ADD? Dyslexia?) because he can never read nor study books for class, only listen to them. I can’t even begin to imagine how hard it must be for him, but by the way he acted around Cath and everyone else, one would think his life was spotless. Arthur, the twins’ dad, always seems to be in his ‘zone’, which is obvious by the way Cath constantly worries about him. Though (again) this is never mentioned explicitly (I think) in the book, Arthur suffers from bipolar disorder – and worsened when his wife left – which makes him obsessed with his work, and unable to take care of his daughters properly. However, though the sudden leave of his two daughters proves to be arduous for him for the first few months, he starts becoming a better and more responsible dad to his daughters, which is relieving to see. These are the main characters that I was most impressed by. Other secondary characters will also be mentioned later in this post. Social anxiety. Though Cath’s progress is clear throughout the book, thanks to the love and support that her family and friends give her which enable her to reach stability at college, the author doesn’t lessen the gravity of the disorder. I personally love reading about characters with a particular mental illness/disorder, because it gives them a different mindset to the average individual. I guess the ‘theme’ that Rowell was trying to convey through Cath’s social anxiety was that everything was going to be okay. As bad as things got with her family, her writing partner, the boy she likes, it all turned out to be alright at the end. Family. Though Cath’s family suffered a great deal when Laura left, the family did a pretty good job on its own, considering all they had to deal with (Arthur’s bipolarity, Cath’s social anxiety, Wren’s carelessness, etc. It did weaken the family and make the characters weak for several years, but it still showed that family love triumphed above any hardships that life threw them in the way. Love. I feel that Cath really learned the true value of love (in family, friendship and love) when Laura tried to gain the ‘easy way’ back into her life, when Nick thwarted their ‘friendship’ by using her, and when Abel ‘broke up’ with her after three banal years and Cath realized that she had never felt for Abel what she felt for Levi. Jealousy. The most obvious one is when Nick attempted to take advantage of Cath’s writing and shy personality. I did not see this coming, and it was probably due to Nick’s subtlety when carrying out this deed. He made sure that Cath was the ‘right’ candidate, and then ensured that she stuck with him in every partner writing assignment, to then make their writing together ‘their thing’ so that he could use the input of Cath’s ideas for his own gain. But Nick was so fixated in his own work that he was blinded by jealousy – in other words, he was pretty much called out for plagiarism by Piper, and even then he tried to coax Cath into signing his work so he could get ‘his’ story published on the school journal (which, of course, Cath refuses to do so). After a thorough analysis of some components of the book, I enjoyed this book because of everything I just analysed above. The subtlety of the plot, complemented by the thorough character development, and the moral themes discussed in it. 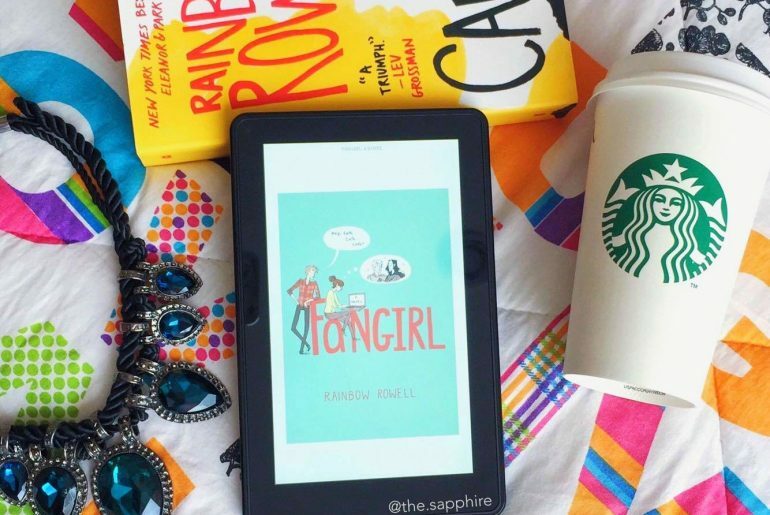 Unlike some YA authors, Rowell doesn’t try to shove it all in your face – it all seems to flow into the story at the right time. When you look at how many main characters (I would consider most of the characters ‘main’) are in the book, there are actually quite a lot of them, all who were were developed. Yet, Rowell was able to save each of the drama moments for the most appropriate time. Half (or more than half) of the books I read are fiction, and it’s a nice change when the main focus of the book isn’t the dark plot twists, and is instead on developing the characters. I did not enjoy the excerpts of Cath’s Simon Snow fan fiction. At all. I felt it was too out of context, and mostly just skimmed through them. That’s why I’ve decided to read “Carry On” by Rainbow Rowell too, a book that’s about Simon Snow, and see if I change my mind. That’s mainly what made me give this book 4 stars.